According to the Amazon detail, this ukulele is made of Mahogany and the Polynesian Tattoo design on the body and fret markers was laser-etched on there. It's got Aquila Strings on there and triangle inlays. I mean, I'm a little surprised that it's only $69. It's freaking gorgeous! Also, if you are one of those giant Samoan guys who is covered in those rad tattoos, then think how great it will be to have a Uke that matches YOU! Heh. Ok, I can only dream that giant Samoan Tattooed guys are reading my blog. Some day, man... some day. 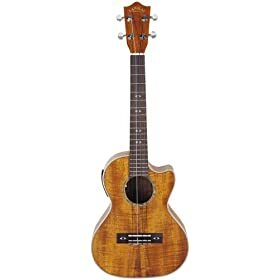 dropDavid, on Twitter, asked me the following, "hey uke guy 😀 i need professional advice, should i buy the lanikai lu21 concert uke? is it a good buy for the price?" Well friend, I think you are gonna be psyched. Let me start out by saying that I have been the proud owner of a CK-TEQ Lanikai Ukulele for about 5 years and I absolutely love it! I know we aren't talking about me or my ukulele, but look at this pretty thing! 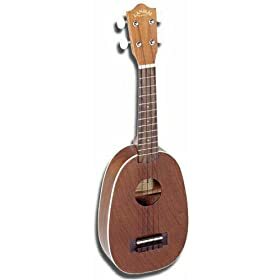 Anyway, I did some research on the Lanikai LU-21 and it looks like a pretty great ukulele for the price. 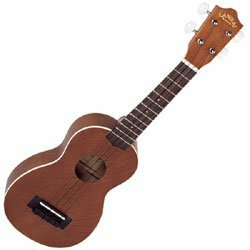 $49 is a great price for your first ukulele and looking through the reviews, it sounds like a good value. There were a total of 12 reviews with an average rating of 4.5 stars. Not too shabby! Lanikai ukuleles are well made and they sound great. Like I said, I'm totally in love with mine. I don't think you'll be disappointed at all. Another uke you might look at is the Oscar Schmidt OU2 Concert Ukulele. It's only $7 more and it looks beautiful. I've never personally played one, but I hear people say that they are quality instruments.